This Culpa Oversize Universal Ice Pack will conveniently help the pains you experience in the neck and larger areas of the body. Keep one in your freezer, for those everyday aches and pains, sports injuries and muscle pulls in the back, neck, hip, thigh, knee, and shoulder. 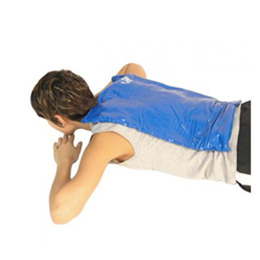 This large cold pack remains flexible and comfortable when cold and provides up to 30 minutes of healing cold therapy. This Culpa Universal Ice Pack can be reused many times. Always use layers of dry terry toweling between Culpa and skin. - For Initial Chilling of the Culpa , remove from all packaging, place flat in Chilling Unit Freezer for two hours. - To keep moist, place in a plastic bag, seal, and then place in freezer. This will preserve them and prevent them from drying out or getting hard. - Never Let the Culpa Dry After Use - Always Keep Them In Freezer. - Remove Culpa from freezer and place a hand towel between the skin and the Culpa . Apply to area being treated.